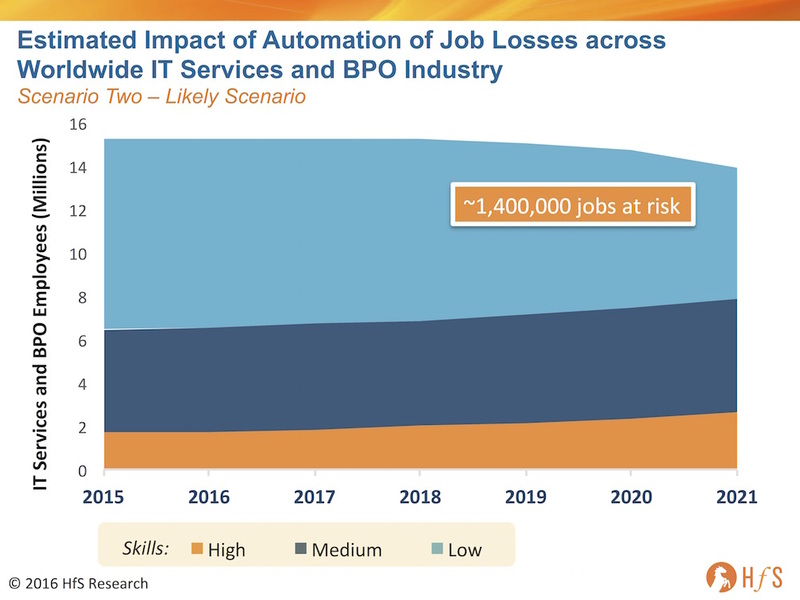 It’s time we dispelled the scaremongering and hype and gave you the true picture of how advances in automation tools and methodologies, such as RPA and autonomics, will impact the global IT services and BPO industry over the next five years. The current debate on these issues is as polarizing as it is confusing. On the consumer-facing side of technology, we have a fervent and far-reaching debate about the ethics of artificial intelligence and automation, led by executives from the likes of Google and Facebook. 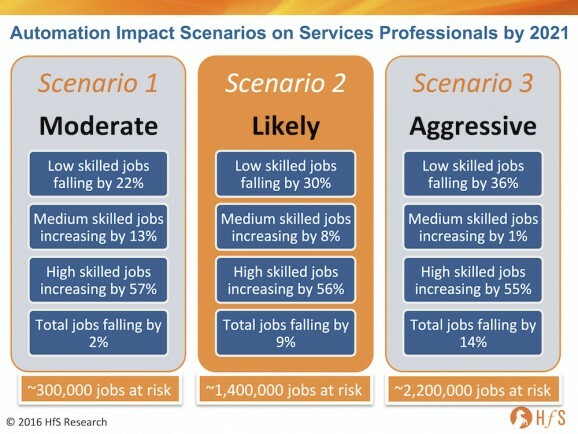 On the enterprise side, we frequently see quotes from studies from firms such as McKinsey and Gartner predicting seismic job losses through the impact of disruptive technologies that could have a devastating impact on the global economy and society in the next few years. Yet, many of the leading stakeholders much closer to the true deployment of emerging enterprise Intelligent Automation tools and platforms—namely the service providers, the ISVs and the sourcing advisors—remain on the sidelines when it comes to discussing the true impact of automation as it’s adopted by many enterprises today. We’ve been talking, for the best part of two decades, about how to “transform” business and IT processes after the cost benefits of labor arbitrage have been maximized. Well, the simple fact is that much of these arbitrage costs are close to optimization for mature services providers that have well-honed global delivery machines. As enterprise clients demand further cost advantages, and as competitors become increasingly aggressive with their service pricing, the focus shifts toward clients attaining outcomes that are not always directly linked to lower headcount rates. Consequently, many enterprises that have chosen to externalize their service delivery can enjoy even more cost effective services, as ambitious service providers further rationalize their delivery organizations by taking advantage of automation to standardize and scale service delivery to their clients. In short, while many enterprises can invest directly in Intelligent Automation into their own processes, they can also simply outsource those processes to service providers, which can embed further productivity gains tied to automation, in addition to labor arbitrage. “Intelligent Automation-as-a-Service” is quickly emerging as a significant productivity option for enterprises as part of their service delivery. Sadly, greater productivity and effectiveness through “digital labor” comes at a societal cost—jobs that were once required are no longer needed. However, we would point out that the jobs that are being phased out are no longer being recreated in any case, and much of this shrinkage will likely come from natural attrition as some people leave the service industry for more relevant jobs in other industries. 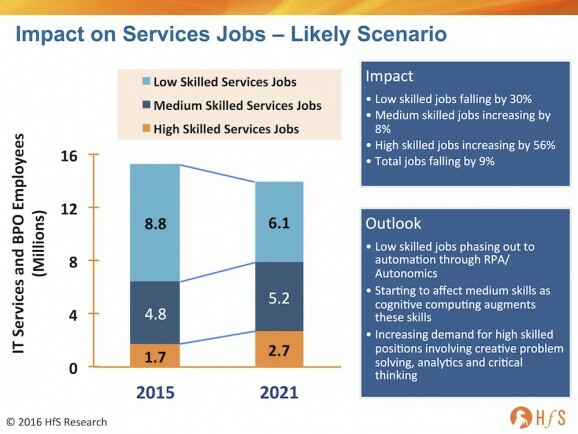 So what does this mean for the future of the global services industry? The business and IT services industry has grown rampantly since the early service deals in the 1960s (with the likes of EDS, IBM and Hewitt Associates) and has reached a colossal scale we estimate close to 16 million workers across the prime delivery locations. Like any major industry that reaches a saturation point, as technological and operational methods improve, the need to continue adding staff will decrease once customer demand slows to modest levels. Just look at the evolution of automotive, aerospace and general manufacturing industries; now the same is finally happening to white collar industries where it is now very feasible to digitize work that was previously manually driven. Finally, automation has truly reached “swivel chair” business processes where manual interventions to process chains can be mimicked into software “recordings” to conduct said sub-task. While smoothing out various processes has the impact of freeing up time for existing office workers to focus on other (possibly higher value) activities, the ultimate effect, besides “human augmentation” is to enable businesses to conduct more of the routine work with less human effort and, potentially, less headcount. Most buyers are constantly investigating how to improve processes and where automation makes sense for them. It’s simply not possible to automate every flawed process chain—the cost and time is simply not worth it, so they need to select processes that warrant the Intelligent Automation investment—usually ones with high intensity repetition and throughput (and lots of paperwork that can be digitized), where RPA has a sizeable positive ROI. In most cases, Intelligent Automation potential is overlooked because the buyer just didn’t have enough financial incentive to make the investment. However, on the sell side, the more service providers can deliver standard process delivery models to their clients, the more cost effective they become and the more price competitive they can be. Hence, smart automation is critical to their business models and competitiveness, and this is where we see most of the impact in the services industry in the coming years. The service providers will delivery efficiently automated services and then be able to pass on these “savings” from “digital labor” to their clients. This is why we envisage significant updates from the service provider community as Intelligent Automation capabilities quickly get embraced and embedded in service models across all core business and IT processes. The choice will largely be down to the workers figuring out whether they want to stay in this industry and learn new skills and ways of working, in order to continue to be effective. As the data plainly shows, the services industry, from an employee standpoint, is likely to be 10% smaller in five years’ time. That may be a significant number of workers, but this reduction is gradual and gives ambitious workers the chance to reorient their skills and job focus. Our industry will likely lose that number (or more) through natural attrition over a five-year time period, so the core issue here is to embrace the value of making processes run better and how this helps us focus on growth initiatives and customer-aligned initiatives. As the head of a call center recently declared to us: “As long as we touch the customer in a valuable way, we can’t be automated.” That says a great deal about where we need to focus as this industry goes though this evolution. Super insights and interesting data. Is this is the impact on IT-BP services firms only? Good article. We are as an industry looking at a step change in how work is delivered. This will happen over a mediumish period, as cultural change issues remain the biggest blocker to this type of change - the numbers stack, but there is massive resistance to change and guerrilla tactics being deployed. Eventually everyone will have to adopt this, as to not is to be uncompetitive. The uncompetitive position for some companies may well happen faster than their ability to change, leaving them exposed. @Harry - yes - this is just the services supplier side. We're working on the client side and inputting more data inputs from our recent studies to get the model right. One thing that is clear is that implementing automation into a supplier's delivery model is absolutely critical for them to stay competitive in this market. We expect much more rapid development coming from the suppliers over the medium term, in terms of "industrializing" RPA and cognitive. What we're terming "Intelligent Automation-as-a-Service". Great analysis, though I cant understand why greater producvity and accompanied shrinking of labor force is called as "sadly, a great societal cost". Is the eradication of farm labour considered a cost or benefit to society? Jobs are a cost,in the ideal world we want less jobs and more leisure. As long as we have problems we will have enough work. We will run out of "jobs", but not "work". You got the idea now. There is a lot of work to be done why can't we create "jobs" around it rather than begging for "jobs". Our fears of automation aren’t due to issues related to artificial intelligence or robotics, but of human intelligence.